In honor of St. Patrick’s Day, I’ve picked three books that have nothing in common except they are all green and geeky books. 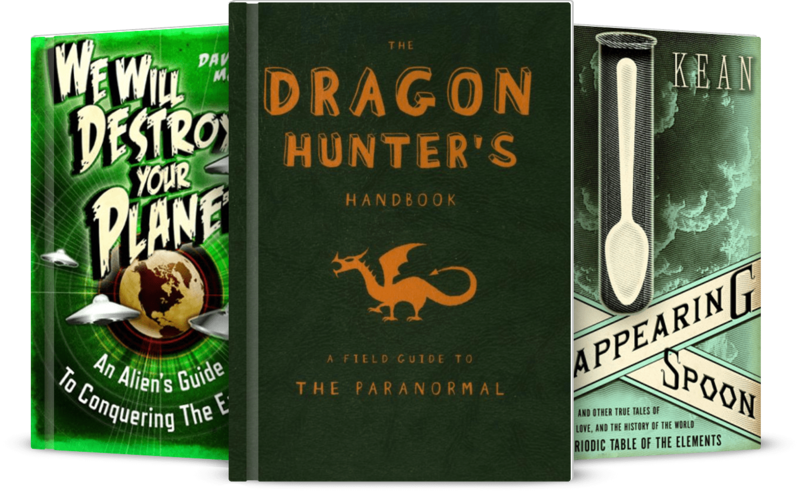 Forest Green: The Dragon Hunter’s Handbook rocks a nice dark green perfect for a field guide. Who wants a bright orange book when you’re trying to stay incognito and hunt dragons? “Some Dragon Hunters wonder if the Loch Ness Monster is really a type of aquatic dragon.” -Pg 34 . Pale Green: The shades of color on The Disappearing Spoon almost look old fashioned, and vaguely suggest (to me, anyway) the colors you might find in an antique pharmacy or old hospital. For a book whose stories about elements on the periodic table often take place in laboratories or, even, hospitals, this seems appropriate. Bright Green: The glorious bright green color of We Will Destroy Your Planet may have been chosen for its similarity to the color of little green men. Shall we call it Martian green? Aliens and the color green have strong association together. Succeed where so many alien races have failed. Time to take a break from Skyrim.